Corby Town have signed defender Delroy Gordon from Bedworth United. It marks a return to Steel Park for the Northampton-born centre-half after he spent the 2011-12 campaign with the Steelmen. 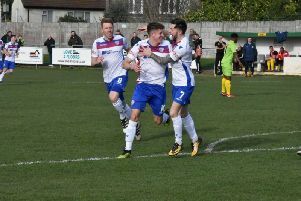 And boss Steve Kinniburgh was delighted to complete the deal as he bids to strengthen his squad for a promotion challenge in the Evo-Stik League South Division One Central. The Corby manager said: “We are delighted to bring someone in who has vast experience like Del does. “It’s going to add to an already good squad. The Steelmen will also be boosted by the return of a couple of key players for this weekend’s clash with Kempston Rovers at Steel Park. Right-back Miles Smith is available again after serving a three-match ban while Jamie Anton will also be back in contention after he was unavailable for last Saturday’s 2-1 victory at Berkhamsted. Corby, meanwhile, have sent youngsters Zac Allen and Dean McBride on loan to United Counties League Division One strugglers Raunds Town. Both members of the club’s academy, which is also headed up by Kinniburgh, the pair have been on the fringes of the first-team this season. And Kinniburgh believes the move to Raunds will benefit everyone involved. “I felt it was important to have these boys in and around the first-team squad for the start of this season,” Kinniburgh explained. “They are both with me on a daily basis as part of the academy but that experience of being with the first-team and seeing what it takes is something that was crucial for them to see. “I have spoken to both of them about their development and it’s now important for them to go and get some experience of adult football on a regular basis. “We want to help clubs who we feel are trying to do things the right way and that’s how we feel about Ben Watts at Raunds.